James Barry and Orla Gallagher. Photo: Clipboard Media Facebook. A Waterford man proposed to his long-term girlfriend in the most extravagant way on Sunday. James Barry spent four weeks planning a surprise that his girlfriend would never forget. 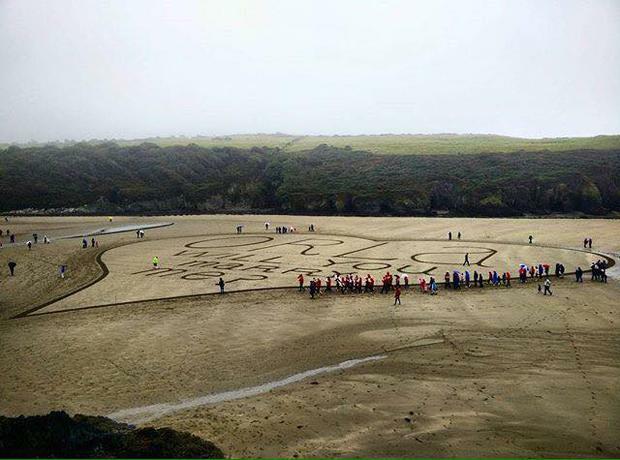 James proposed to his childhood sweetheart of 13 years, Orla Gallagher, by enlisting sand artist Sean Cororan to write “Orla, will you marry me?” in an enormous heart on Stradbally Cove, Co. Waterford. Furthermore, the City of Waterford Brass band marched around the heart playing Matrimony by Gilbert O’Sullivan as the question was revealed. The event came as a total surprise to Orla, who delightedly said yes, with James managing to conceal his plan right until the last minute. “I’m still in shock, my hands are shaking,” Orla told reporter Donal O'Flynn after James popped the question. If that's not love, then we don't know what is. Karen Birney Niamh Eustice (nee Osborne) from Dublin, and Hari Eustice, who was born in Wales but grew up in London, knew they were meant to be the moment they met.